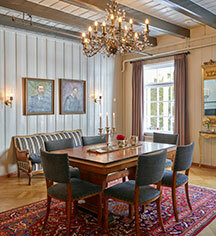 Today, Fretheim Hotel remains a popular retreat amid the lush green mountains of western Norway at the mouth of the clear blue Sognefjord, featuring 121 comfortable guestrooms decorated with antiques, intricate wallpaper, and traditional furnishings. With a variety of meeting and conference spaces able to accommodate any occasion, and a restaurant passionate for serving delicious eco-friendly dishes, Fretheim Hotel offers excellent service and warm hospitality. 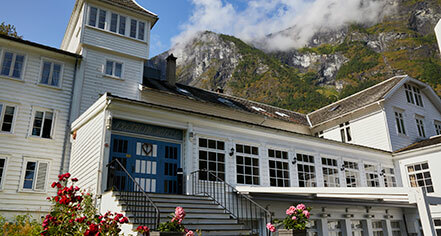 Fretheim Hotel, a charter member of Historic Hotels Worldwide since 2012, dates back to 1870. Fretheim Hotel was originally a farm. In the mid-1800s English lords started to come as tourists to the Sognefjord. They came with big ships, searching for good salmon rivers. They took shelter with the largest farmers, and in Flåm that was at Christen Fretheim farm. Parking: On-site parking: Available; complimentary. Learn more about the History of Fretheim Hotel .